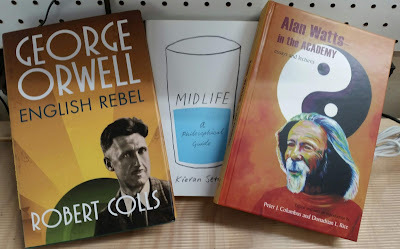 I find myself increasingly interested in biographies, and I haven’t read one of Orwell yet. A positive blurb on the jacket from John Gray convinced me that this one was worth three dollars and a couple evenings of my time. I’ve seen a few reviews of Setiya’s book about midlife, none of which made it seem compelling, but again, for a few dollars, I’m open to being surprised. And with a birthday coming later in the month, I’m particularly interested in reflections on this stage of life. I had never even heard of this book of Alan Watts’s scholarly output, and I’ve been searching out his writings ever since I first got online! This is why I love patronizing library sales in big cities with universities nearby. There was a bit of discussion this week, kicked off by Kevin Mims in the NYT, and encompassing Jessica Stillman, Micah Mattix, and Patrick Kurp, with cameos from Nassim Nicholas Taleb and Umberto Eco, on the vexed question of having “too many” books, especially unread books. I like the idea of using a personal library as a research tool which requires unread books for future reference, though I fear my credentials as a scholar wouldn’t pass a cursory background check. “I’m sorry; you bought all of these to furnish material for…some blog posts?” Still, there is a large number of books that I wouldn’t necessarily want to read, but nevertheless find attractive. Some of them are just handsome objects, and I think they’d look sharp on my shelf. Others are attractive because they’re about some weird and wonderful topic that I had never thought of before, and it gladdens me to know that they exist. They’re like compact reminders of Hamlet’s admonishment to Horatio that the world is far more diverse and interesting than we typically realize, little portals to undreamt-of places scattered throughout space and time. In that sense, I could see myself being a devoted, if superficial, collector — “That one? Oh, I don’t know, I’ve never read it. I just think it’s great that someone wrote it, and besides, isn’t it nice to look at? Only cost me three dollars!” Perhaps the magpie, rather than the owl, should be my spirit animal. « Leggo My Ego	» Everything Is Broken. Everyone Is Broken. Why Can’t We Forget?